With the little guy in his drum lesson, I found meself wandering through the aisles at a nearby Whole Foods the other afternoon. I'll typically stop in for a moment or three to pick up organic milk, locally sourced eggs, and non-factory-farmed meat for my boys. And maybe a baguette. The baguettes are fresh baked and authentic, and warm baguettes and brie are un cadeau from Dieu. But the price point for pretty much everything else is just out of reach. As I meandered, I noticed a display that I'd somehow missed before. It was near the section that smells like lotion and incense, where they keep the alternative medicine and supplement supplies. There, on a little display table, were a panoply of faith tchotchkes. 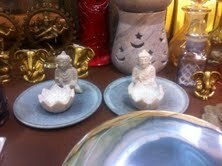 Here, a little ceramic Buddha statuette. There, a Krishna, in a classic multi-armed Karate Kid crane stance. Next to the pocket-sized bronze Krishna was a bitty little bronze elephantine Ganesha disappointingly sporting only two arms, but with a cool rune on the forehead. Above them, a sign saying "Spirituality, Life Balance, and Something Something." I honestly don't remember. Around them, boxes of incense, all more than a little bit overpriced. And that left me in something of a quandary. As a representative of a faith missing from that table, should I have felt troubled that Christianity wasn't represented when it comes to spirituality, life balance, and something something? Doesn't Christian faith have any purchase with the sleek and upscale clientele that gets their organic free range living on at Whole Foods? Are we missing out on that entire demographic? On the other hand, I was a bit relieved. If there'd been a couple of two inch tall brass Jesus figurines, with convenient holes in the hands and feet for mounting incense sticks, I think it would have bugged me more. Faith and the marketplace just aren't two tastes that sit well together in my spirit. Perhaps it's a Jesus thing. I do wonder, for my non Abrahamic brothers and sisters, if they have the same reaction to faith baubles and trinkets that I do. Yeah, I know Ganesh would be cool with pretty much anything, being the god of transactions and all. Bobbleheads? Bizarre Bollywood kid's movies? You name it, he'll lend his brand to it. But Krishna? I think it'd cheese him off. The Buddha, on the other hand, probably just wouldn't sweat it.